At Signs by Van, we are dedicated to making your business more open and inviting for your customers. What is the best way to do that? Have a custom sign made, of course! You can learn all about the process of getting a sign made and it’s even easier than you might think–whether you have a logo or not, we can help to give you a sign that you’ll love and that will welcome your customers in. Located in Salinas, CA, we are well-equipped to serve our area by providing people with memorable signs that enhance their buildings. Whether you’re the owner of a restaurant, a hotel, a sporting goods store, or anything else, we’re happy to build incredible signs that make business owners proud. Why choose one of our custom signs? Keep reading to find out! The way your company identifies itself matters. 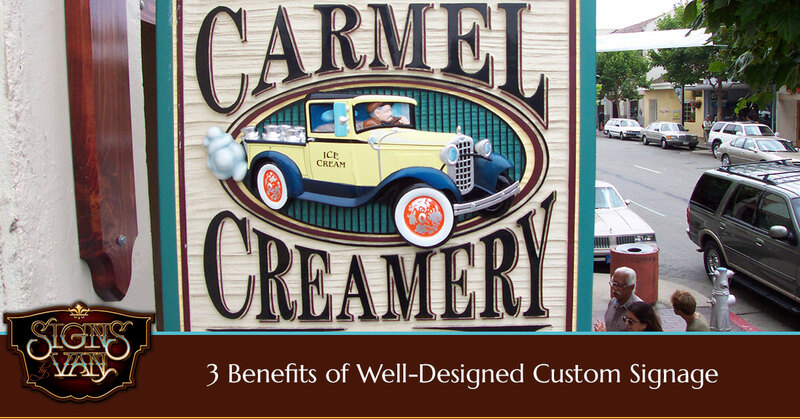 An attention-grabbing sign can make the difference between a new customer and a person driving right by. Of course there is a thing as being too attention-grabbing. Fortunately for you, the team at Signs by Van knows how to strike the balance between eye-catching and classic. Whether you opt for dimensional lettering to make your sign stand out or you want your logo to really pop, having a memorable sign helps people to keep your brand in mind. It also helps to differentiate you from your competitors and leave a positive impression. Research has shown that companies who utilize visual marketing effectively can see a drastic improvement in sales across the board, and that’s the point of it all, isn’t it? All it takes is a quick look at our portfolio of custom signage to see what a difference a unique sign can make. After all, it could be the difference between catching someone’s eye and losing them forever! We have created restaurant signs, hotel signs, and much more. We love what we do and we’re happy to work with our customers to create something that’s truly unique. Get Your Custom Wood and Metal Signs Today! Whether you have something specific in mind or you’d like to rely on our experience to get you started, we would love nothing more than to help your signage come to life. Ready to get started? We’re looking forward to working with you! Feel free to reach out to us online and we’ll get back to you as soon as possible. Prefer to speak on the phone? Give us a call at 831-200-9680 and we’ll get started on crafting you the business sign you’ve always dreamed of having.